JUNE 13--A St. Louis man claims that he was injured last year after being glued to a toilet seat in a Home Depot and is suing the retail giant for negligence. Haywood Rosales, 31, charges that during an August 2007 visit to a Home Depot in Florissant, Missouri he used a store bathroom and came into contact with a toilet seat 'covered with adhesive,' according to his Circuit Court lawsuit. Rosales's lawyers told TSG that their client did not notice the adhesive before sitting down and that he used his cell phone to alert his wife, with whom he was shopping, after realizing 'he was glued to the toilet seat.' A copy of Rosales's June 11 lawsuit, first reported by Courthouse News, can be found here. When Rosales stood up, the complaint asserts, he 'received cuts, bruises, and tearing on his buttocks and thighs,' and subsequently 'endured the embarrassment, pain, and suffering of the initial injury and its concomitant treatment.' Rosales, who claims he was 'rendered unable to work' by his injuries, is seeking in excess of $25,000 in damages. Rosales's lawyers said their client sued Home Depot after the retailer's insurer 'summarily rejected' a claim. 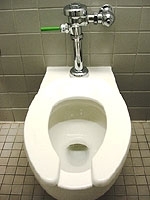 In November 2005, a Colorado man filed a similar lawsuit against Home Depot, alleging that he was so fused to a toilet seat that paramedics had to remove the seat from the toilet to get him out of the store bathroom. After almost two years of litigation, the Colorado case was dismissed after a federal judge ruled that Home Depot did not have prior 'actual or constructive knowledge' of the dangerous toilet, nor was the glue prank foreseeable.